Meetings are from 10.00 am to 11.45 am at Holcot Church Room on the second Wednesday each month for which there is small charge of £1.00 per person to cover the hire of the room, tea, coffee, biscuits, etc. 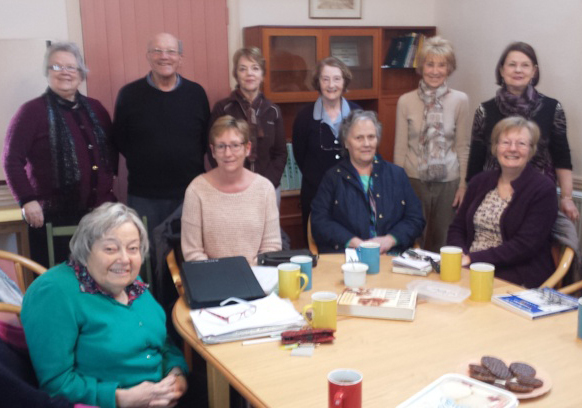 We are a friendly group who welcome new members and enjoy learning from each other. Please contact John Roberts, the Group Leader, at john.k.roberts@talktalk.net or on 01604 642732 for more information. The idea is that we all try to contribute something, however brief, on the topic set for the meeting, with a time limit of 15 minutes each. We may need to vary the planned programme in the light of experience eg by carrying forward unfinished topics. Chris Rowe has again kindly offered to bring her projector to any meeting if it is required. Please let me know whenever you want to use it. Tell us about one of your ancestors in whom you are particularly interested, for whatever reason. Tell us about anyone in your family who has served in the army, navy or air force (of any country). Discussion of the records we are keeping and the different methods of presenting our findings. The problems encountered with digital and paper records. Do we keep records for our own use or for future generations? Bring any object, which might include pictures or writing, and talk about its origin and why you treasure it. Tell us about any family history relating to railways. This could be about people who worked on the railways or travelled on them. Tell us about family members who worked in shops or pubs. Tell us about anything in your research which relates to the Poor Law during the period 1834 – 1929. Tell us about anything relating to education. How have school or university records helped you? Tell us about your ancestors in 1919, when Europe began to recover from the Great War. Tell us what you think future generations ought to know about your parents. Describe how your ancestors spent their leisure time. Review 2019 and plan programme for 2020.